Our today’s route will pass through Kokernag—--Deval Gam-----Vailoo-----Daruloom-----Daksum—--SinthanTop-----Singhpura-----Dichar-----Chatroo Nullaha-----Bandar-Koot-----Dul-----Sheikhpora-----Chowgam-----Kishtwar-town----- Drabshalla-----Thatri-----Premnagar-----Ghuraka-----Mandelah-----Paka-Pul-----New Doda town. The distance from Kokernag to Doda town that we would be travelling today is about 220 Km. But the road is narrow, rugged, and dangerously uneven with sharp bends and blind turns that is full of dangerous landslides and small rivulets crossing. So today we may take 8 to 9 hours of travelling. Because wherever we may like the scenic beauty of nature or other natural places of attracting views, we may stop to enjoy, relax and click pictures. We just want to enjoy our this adventurous and exciting motor biking trip rather than rushing like an impatient traveller. Our today’s proposed Night halt is at Doda town’s government guest house. On 30th of August 2012, after our morning breakfast at Kokernag, we filled our motor bikes fuel tanks to full capacity, knowing it well that there won’t be any petrol bunk available on the way, untill we reach Kisthwar town which is about 140 Km away. Then we drove our motor bikes towards Sinthan Pass that connects Kashmir valley with Jammu region. As we drove past the Kokernag Gardens, after many small hamlets, the first popular village that comes on the way is Daksum. Daksum is located at an altitude of 2,438mt (8,500 ft) above the sea level. It is situated at a distance of 40 km from the main district headquarters that is Anatnag and about 85 km from Srinagar and is about 15 Km from Kokernag. It is on the trekking route from Kokernag to Kishtwar. From here many trekking trails lead to Kisthwar through Sinthan Top. The picturesque Daksum is situated amidst the magnificent grandeur of the springs; it presents an awe-inspiring awesome sight. Daksum offers peace and tranquillity. The only sound heard there is that of cascading Bringhi River, rushing right through its centre. Daksum is a place where you can revel in solitude and be one with nature. Pine trees; green meadows, clear gurgling brooks, fresh mountain air all promise to make your experience invigorating and long lasting. Daksum in Kashmir valley is a must for those who are fond of treks and nature. A walk in Daksum will take you up to the hills enveloped in lush coniferous trees and past gurgling brooks. The simple music coming out of the flute of an unseen shepherd tending to his flock will keep you mesmerized. The landscape of Daksum is quite serene. From the tree-covered hills, you will suddenly find yourself in grassy meadows serving as host to the pasture grazing herds of sheep. The invigorating mountain air, the calm and serenity, the densely clad hills, all make the trip to Daksum a memorable experience. Then, there are the snow-capped mountains in the background that further enhance the beauty of this place. Daksum is also famous for its trout - an angler's heaven. From Duksum onwards the gradient of the road is a very steep climb and at certain stretches the road is bad, full of landslides and small rivulet those are crossing the road and at certain stretches the sides of the road were covered with thick, hard snow. So we had to practically drive very carefully otherwise we may have had invariably met with serious accidents. These are the pictures of Birch Trees. In olden days the barks of which were used for writing literature.are the pictures of Birch Trees. In olden days the barks of which were used for writing literature. Just few km before Sinthan Top, at a height of nearly above 10,000 feet a whole stretch of white barked fir trees starts. In olden days the barks of these trees were used as fine, smooth, thin sheets to write scripts of written literature. And these barks would lasts for centuries without getting frayed or spoilt. Even today we in India have thousands of such written documents to prove its authenticity. The Sinthan Top, at 12,450 ft., is one of the barren passes of Pir Panjal. 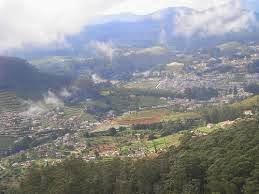 The top portion of this Sinthan top is completely bald without any dense forests of Deodar, pine or fir trees. It’s just a plateau. Once we reached on the top portion of the Sinthan top, it felt as if we were on top of the world with plenty of fresh pollution free air and cold breeze and it felt as if the aquamarine blue sky was just at a height of our arms length. At this height we could really touch the sailing clouds. 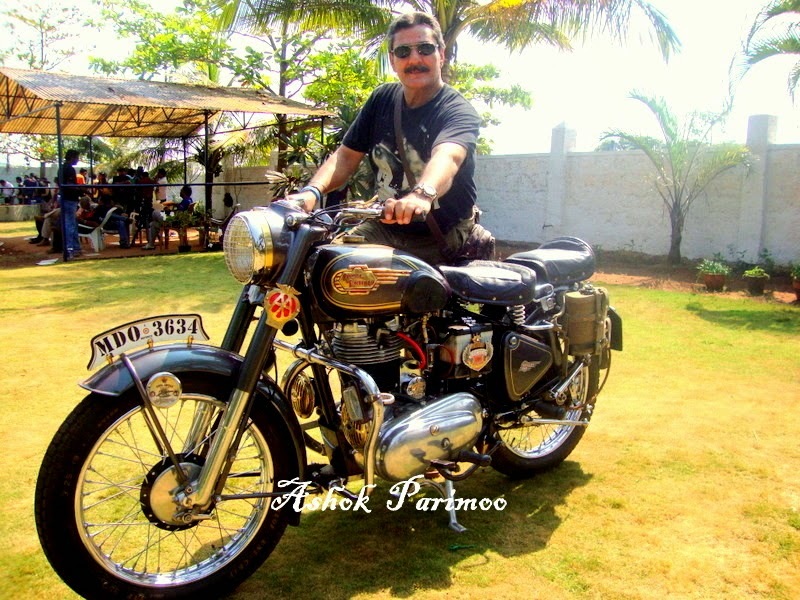 To inspire our thrilling excitement of achieving one of the most thrilling experience of riding through one of the most difficult strenuous terrene road. At top of the Sinthan Top there is a huge high rectangular steel structure which reads as “WELCOME TO SINTHAN TOP” and shows the road distances of few nearby towns. This high steel structure is erected by Boarder Road Organization who constantly manages the whole stretch of road. After Sinthan Top, to drive towards Kishtwar the road starts descending at steep gradient. The road is fairly ok except at certain stretches. On the way till Kishtwar town we have to pass through many small hamlets and villages. All along the stretch the population is very thinly inhabited. Wherever and whenever we came across any small village, near these villages on either side of the road there are small water-mills, those in local language are called “Chakkies”. These “Chakkies are olden days milling machines which are operated with the force of water and are used for grinding, wheat, spices, corn, chillies etc. On the way to Kishtwar we have to cross Chenab River twice. Once at Chatroo Nullaha and then at Chowgam. And after that all along our journey from Doda till Batote our road is all along parallel to Chenab River. All along the road the drive is dangerous and scary. Any small or big mistake while driving is sure invitation to fatal death. From Chowgam there is a road which goes towards Keylong---Tandi (which is on the way to Leh from Rohtang Pass, in Himachal Pradesh) and this road is called as Keylong--Tandi--Kisthwar road. Now under construction is the Kishtwar-Anantnag tunnel that will pass through the Sinthan Pass. The ambitious project to bore a tunnel between Vailoo in South Kashmir and Singhpora in Kishtwar, once completed, will revolutionise road connectivity between the Kashmir Valley and the Doda region of Jammu. Even as work continues on the road which goes through one of the highest passes in the Himalayan region (Sinthan Top) that will connect Kishtwar, (the remote district in the Doda region), with Anantnag in South Kashmir. The tunnel will shorten the travelling distance from eight hours to two hours. The five-km-long tunnel is financed by the Jammu and Kashmir Bank on a public-private-partnership basis. International bids have been invited to take up the work. Recently a technical team of consultants from Mumbai visited the area to conduct an informal survey for making the departmental Project Report (DPR). They trekked 13 km to see how the work can be made possible. The team was accompanied by Minister for Roads and Buildings G.M. Saroori, who has been pivotal in pushing the project through. He later told The Hindu that the tunnel will be completed in two years, after the bidding is finalised, at a cost of Rs.640 crore. Under the Prime Minister's Reconstruction Plan, Rs.640 crore has already been earmarked for the road that will pass through Sinthan Pass. Work on the project was stopped in 2008 when militants killed four General Reserve Engineering Force (GREF) personnel, including a Lieutenant Colonel, on June 13 that year. While the BRO proposed a six-km-long tunnel between Pahalgarh and Alan Gadole, the State government prefers a four-km-long tunnel from Singhpora and Vailoo. The work is almost complete on the Anantnag side but only light vehicles from South Kashmir to Kishtwar ply on a daily basis. The Pass closes soon after the first snowfall until April. A traveller has to cover 290 km to reach Kishtwar via the Srinagar-Jammu highway, and the Srinagar-Sinthan-Kishtwar road reduces the distance by 200 km. Earthwork and two-laning have been completed from Batote to Chatroo on the Kishtwar side, but the middle stretch needs a lot more work. 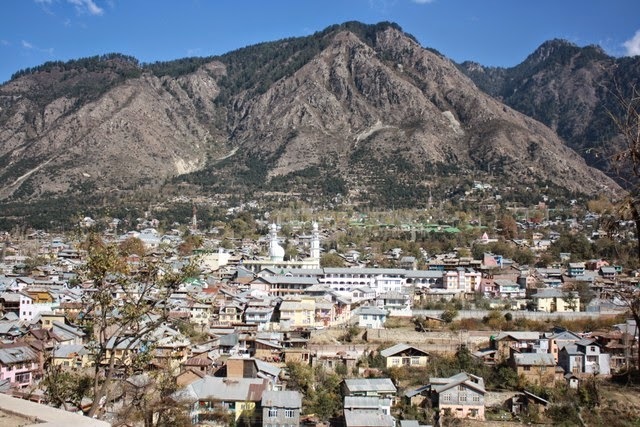 Kishtwar is first referred to in the Rajatarangini by the ancient name Kashthavata, during the reign of Raja Kalsa of Kashmir (1063–1089), when "Uttamaraja", the ruler of Kashthavata visited the court of the Kashmir King in company with several other hill chiefs to pay their respects to the Raja. The Mehta Family was given the lands of Kishtwar by the King of Kashmir. Their family temple "Hatta Wali Mata" and their heritage can still be tracked back to Kishtwar. The founder of this family was the Commander-in-Chief of the Kashmir Army "Sip-E-Salar Sri Jiya Lal Mehta". Known for his bravery and velour he fought the Mughals and northern raiders who invaded the land. The main language spoken here is called Kishtwari (related to Kashmiri language) by locals. 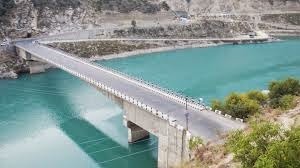 The Chenab River flows through the district and is the site of the hydroelectric power projects of Dul Hasti 780 MW, Ratle 480 MW, Kirthai 1400 MW, Pakal Dool 700 MW, Lower Kalnai 200 MW and Chaudhary 150 MW with the highest per capita wattage production in world for such a small area. Kashmir sapphire was mined at Padder valley. And gypsum is mined at Trigam. The famous Sinthan and Margan tops are high motorable road passes. The Steep Brahma mountain peak is situated at Dachhan. Saffron of purest quality is produced in the iron rich soil at Pochhal, Matta, Lachdayaram and Hidyal. Kishtwar National Park, in the northeast region of the district, has a large number of peaks and glaciers. Kishtwar is endowed with dense forests of Deodar, pine and fir. There are high altitude mountains ranging between 20,000 feet to 21,000 feet like Num Kum, Burmah and Barnag. Pilgrims and tourists visit shrines in the area including Ziarat Zain-Shah-Sahib, Farid-ud-Din Sahib, Hazrat Asrar-ud-Din Sahib, Athara Bhuja Devi temple, Chandi Mata temple, Hatta Wali Matta and Macheil Mata. The Kishtwar Himalaya is a small sub-range of the Himalayan mountain range. In states of Jammu and Kashmir, and Himachal Pradesh. It is a dramatic range of steep rock and ice peaks with great local relief. However it is not as well known as other parts of the Himalaya since its highest peak, Bharanzar, or Sickle Moon, is only 6,574 m (21,568 ft) in elevation. One of its best-known peaks is Brammah, 6,416 m (21,050 ft). There is a valley named Padar valley near Kishtwar. Formerly this valley was under the rule of Himachali kings. Legend has it that this valley was given to the king of Jammu as a dowry. A mixture of Hindu and Buddhist people live here. The Paddar valley is famous for its sapphire mines. The slopes near the place are packed with abundant of wild-life. It has many hot springs, great hiking, and a river, ideal for cannoning. No concrete material is available about the early history of Paddar. However, it is said that there was no one in Paddar till 8th century. It was just a meadow. The people from nearby areas such as Bhaderwah, Lahaul and Ladakh were attracted to see the grazing lands. They used to come here to graze their cattle. With the passage of time, they settled there permanently. Paddar was under Googay rule, during 10th century. It remained under their rule till 14th century. After 14th century, Paddar got separated from Googay rule and divided into smaller parts. These parts were ruled, by smaller Petty Ranas (Rana is an Old Hindu word for a ruler who is less in Power than a Raja). The Ranas of Paddar were Rajputs, Every village or every two or three villages used to have a Rana who often fought against the next village Rana. The area was inhabited mostly by Thakur community. People were serpent worshipers but they observed other Hindu rites and rituals as well. One can see temples of different Nagdevtas or Serpent Gods which are adorned with wood carvings of snakes of many forms. Besides Hindus there are also Muslims and Buddhists. The first Muslim came to Paddar during the period of Shantar Kantar Rana from Chamba who used to make the pots of soil. The descendants of those Muslims are still living at Atholi and kijai. In the middle of 17th century AD Chattar Singh, the king of Chamba also attacked Paddar. He first conquered Pangi from where he advanced with about 200 men to Paddar and annexed it. He constructed a fort after his name as well. The local Ranas could not face the onslaught of Raja Chattar Singh. They accepted his suzerainty and became his tributaries and began to work as his Kardars. The impact of Chatter Singh’s conquest lasted long and Paddar area continued to be the part of Chamba up to 1836. From Chattar Singhs period onward Paddar remained comfortably under the kings of Chamba for five to six generations. Under the leadership of Ratnu Thakur the people of Paddar attacked Zanskar in 1820 or 1825 (Zanskar was with a Bhot Raja under Ladakh). He made it his tributary. The Bhot Raja agreed to pay (Rupeeya) Rs 1,000 , besides musk bags and other things annually as Nazar (present) to the Chamba Raja. As soon as General Zorawar Singh reached Kishtwar he heard of an uprising in Ladakh and hence left for Ladakh via Zanskar. From this route Leh is 275 miles from Kishtwar, which is the shortest route between these two places. Zanskar area falls en route Bhot Nullah. The army of Gen. Zorawar Singh entered Zanskar (Ladakh) through Paddar. This time wazir Lakhpat Rai Padyar, who was a trusted officer of Gulab Singh, also joined Zorawar Singh in the second attack on Ladakh. After conquering Ladakh a part of the Army was sent to Kargil and Zanskar under the command of Wazir Lakhpat Rai and Col. Mehta Basti Ram as Zanskar was not under them till then. After conquering Zanskar, the army returned to Jammu through Paddar. 30 soldiers of Dogra army were kept in Chattar Garh fort to keep in touch with the soldiers fortified in Zanskar. During this period a rebellion broke out in Zánskar and the Dogra soldiers present there were massacred. On hearing the news Ratnu Thakur, who was the highest employee of Chamba government instigated people and caught hold of Dogra soldiers. Some of them were made prisoners and sent to Chamba. This made Gen. Zorawar Singh mad with rage. He intended to attack paddar. In 1836 General Zorawar Singh along with 3000 soldiers, attacked Paddar from Zanskar through Bhot Nullah route. To escape from the onslaught frightened Ratnu demolished the bridge on Chenab. For this reason, the Dogra army had to wait for three months. With the help of some local peasants they made a ropeway bridge and crossed the Bhot Nullah and led a furious attack on Chattar Garh. The whole town was set on fire. It was heaps of stone all around. Many people were hanged some were disfigured. A new fort was built in place of Chattar Garh. An officer along with a few soldiers was stationed there for the watch of the fort and Paddar became a part o Dogara state . Ratnu was arrested and sent to Jammu, where he remained under detentions for three to four years. Subsequently, he was released and granted an estate in Kishtwar. Those days Paddar was under the Tehsildar of Bhardarwah. After conquering Paddar Gen, Zorawar Singh went to Zanskar via Umasi La (Dharlang) about 17,370 feet from sea-level to quell the rebellion there. He succeeded in establishing peace. In 1837 a fierce rebellion broke out in Leh and Gen. Zorawar Singh covered the journey from Kishtwar to Leh in about ten days. In May 1838 Zorawar Singh got a fort built at Chisoti (Paddar) on his way back to Kishtwar. In 1845 during the rule of Maharaja Gulab Singh, both Paddar and Zanskar were given the status of Tehsil. Later on, when Leh got district status, Ladakh was merged with Leh and Paddar was merged with Kishtwar tehsil during the period of Maharaja Ranbir Singh in 1963, Paddar was given the status of block by the government of Jammu and Kashmir . Now, it enjoys the status of a tehsil. Gulabgarh-- - It is the significant village of Paddar. Atholi --- It is known for its waterfall here in this village, a very scenic spot called Pathaal and a water mill (locally known as Ghiraat). Tatta Paani - --This village is known for its natural hot springs. 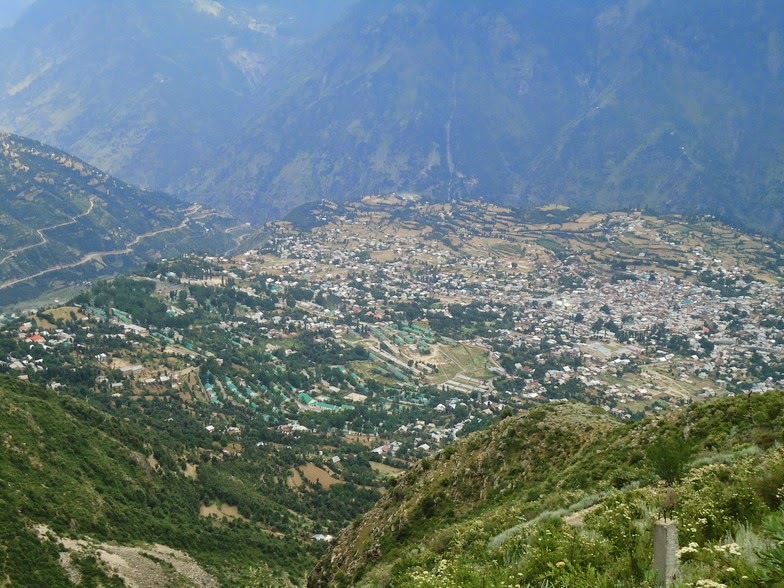 Sohal --- This village is famous among the trekking trails. Gandhari - This place is famous among mountaineers, hikers and climbers and known for green pastures. The trek route from here meets Zanskar in Ladakh and village of Machail. Mela Magh --- This is the most famous festival in the area celebrated for three days in village Ligri in which thousands of people drawn from all villages take part. This festival is celebrated after a gap of one year. The disciples (Chelas) of gods & goddesses, attired in local woolen (Pattu) dresses with locally made grass shoes, perform specific godly devoted dances. The august mela is celebrated for three days in village Shail, Ligri & a visit to the holy lack at the upper reaches of Munhal Dhaar for third day respectively. Zaagra --- A huge fire is lit in front of a temple of god/goddess during night and the chelas (disciples) along with other locals dance around the fire on a sound of Dhols and Flutes. Mithyaag --- This festival is celebrated to mark the onset of spring during which the Mother Land is worshiped for better crop yields. People gather at a particular place and dance collectively around the sacred weapons of the gods. There is a National Park located in the Kishtwar district. It is bounded to the north by Rinnay River, south by Kibar Nala catchment, east by main divide of Great Himalaya and west by Marwa River. The National Park encompasses the catchments of kiar, Nath and Kibar nalas, all of which drain south-west into Marwa River which joins the Chenab River just above Kishtwar Town. The terrain is generally rugged and steep, with narrow valleys bounded by high ridges opening in their upper glacial parts. The area lies in the Central Crystalline belt of the Great Himalayas. Rocks are strongly folded in places and composed mainly of granite, gneiss and schist, with the occasional bed of marble. The shallow, slightly alkaline soils are mostly alluvial with gravel deposits (Kurt,1976;Bacha, 1986). Racial groups include Thakurs, Kashmiris,Gujars, Rajputs and Brahmans (Bacha, 1986). It is said that one of the ancient Rajas of Kishtwar whose dominion extended beyond Doda persuaded one utensil maker Deeda, a migrant from Multan (now in Pakistan), to settle permanently in this territory and set up an utensil factory there. Deeda is said to have settled in a village which later on came to be known after him. With the passage of time the name Deeda has changed into Doda, The present name of the town. The entire area of District Doda including Allaqa Dengbatal (Tehsil Mahore) was initially divided into two independent States of Kishtwar and Bhaderwah. The erstwhile Kishtwar State had been divided into eleven parganas of proper Kishtwar, Nagseni, Padder, Marwah, Warwan, Dachhan, Kontwara, Saroor Sarthal, Zanskar, Bawanjwah and Doda-Siraj-Banihal. In other words, Kishtwar State consisted of all areas of the present District Doda including Deng Battal (Tehsil Mahore of Udhampur district) and Zanaskar of Kargil and excluding present Bhaderwah, Bhalessa, Thathri Tehsils, Marmat Galihan, Raggi, Assar, Batote areas of Doda and Ramban Tehsils. The history of Kishtwar dates back to 200 B.C. When the revered Buddhist scholar Nagsena was invited to a discussion by king Mender in his palace at Sakla. In the discussions Nagsena replied all the questions of the king who then embraced Buddhism and became king Milinda. Nagsena recorded the discussion in "Millinda Panha" a Pali Treatise on the fundamental principles of Buddhist philosophy. Kahan Palor Kahan Sen was the first Raja of Kishtwar who belonged to the royal dynasty of Vikramaditya of Ujjain. He had established his rule much earlier than 1087-88 A.D. He was succeeded by Raja Gandarb Sen and subsequently by 45 others in line of succession. The territory of Kishtwar was conquered by Raja Gulab Singh in 1821. A.D. when Raja Mohd Teg Singh surrendered at Doda without any resistance. Kishtwar was annexed to Jammu kingdom in 1821 A.D. but Gulab Singh did not visit Kishtwar. He appointed Mian Chand Singh as Amil (Administrator) of Kishtwar. One Lak Shan was appointed as kardar under Chain Singh (Neeli Akhon-wala). Chain Singh was replaced by Mehta Basti Ram as administrator of Kishtwar. Raja Gulab Singh appointed Zorawar Singh as Governor of Kishtwar in June 1823 who remained in power up to 1841. Marwah was annexed to Kishtwar during Zorawar Singh's first Ladakh expedition (1833-34). From 1934-1841 Zorawar Singh led four expeditions to Ladakh. When Zorawar was busy in crushing rebellion in Zanskar, Ratnu the Palsara or Chief Official of Chamba Raja in Paddar, stirred up the people and seized the Dogra soldiers kept at Chaattargarh Fort in Paddar. In the spring of 1836 Zorawar Singh personally commanded a large force of about 3,000 men to avenge the insult. Chattargarh's name was changed to Gulabgarh. When Zorawar Singh conquered Paddar, Ratnu fled away to Chamba where from he was sent to Jammu as a prisoner. During the fourth invasion of Ladakh, Zorawar Singh was killed on December 12,1841 by a Tibetan soldier in the battle of Doyo. On the death of General Zorawar Singh, Mian Jabbar Singh was sent as Governor of Kishtwar in 1842 A.D. In 1846 A.D., the whole of Jammu and Kashmir situated in the eastward of the river Indus and westward of the river Ravi including Chamba and excluding Lahul was handed over to Maharaja Gulab Singh. Thus the province of Kishtwar also formed part of the J&K State. Sometime during 1875 ADD the J&K State was divided into two division called provinces and the status of Kishtwar got reduced to a district with Ramban as its Tehsil. Lala Sarb Dayal is considered as the last Governor of Kishtwar province. 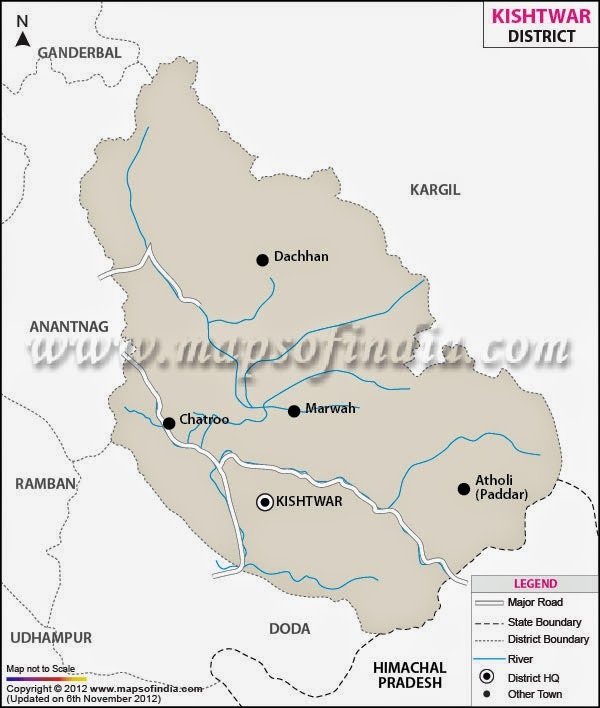 Kishtwar remained as a district headquarters upto 1909 A.D. and was then placed under Udhampur Wazarat. District Doda was ultimately carved out in 1948 A.D. The Islamic faith entered the region of Kishtwar, when Hazrat Shah Farid-ud-Din came over to Kishtwar via Dengbattel, Ramban and Doda, in 1664 A.D. When Raja Jai Singh ruling the while going to Kishtwar, he stayed at Doda for the long long 14 years and then left for Kishtwar. The principality of Bhadarwah was distributed into 15 tharas or administrative units. The total area of Bhaderwah Jagir (including Bhalessa etc) was 533 sq.miles which after amalgamation with Udhampur district in 1931 was reduced to 213 sq.miles only. The earliest mention of the place is traced from Rajatarangni around (1112-28 A.D.), where the place has been named as Bhadravakash i.e. good resting place. According to the genealogical role of the Rajas of Billawar, the State of Bhaderwah was found about fifteenth century by a Scion of Balauria family, but later on, came under the control of Chamba. Thus it may be presumed that the State was established any time around 12th century, but the events of the place, right up to the close of 16th century are not very clear. Nag Pal (IInd) was the son of Maha Pal who, like his father was a great devotee of Basak Nag. He is said to have ruled for one hundred years. Mela Patt is celebrated at Bhadarwah in honour of Nag Pal's spiritual victory over Emperor Akbar. After Nagpal (IInd) the political conditions of Bhadarwah principality were very uncertain up to the 17th century. Nag pal is said to have died about 1620 A.D. Nag Pal (IInd) was succeeded by Bhakhat Pal (1620-35 A.D.) and many others. Bhadarwah became a part of Chamba State during the reign of Charat Singh, (1821-44 A.D.). His brother Zorawar Singh was appointed its Administrative Governor. Being a man of fine tastes Zorawar Singh preferred to stay at Chamba and administration of Bhadarwah was conducted by a succession of Subedars, who could not win over the local inhabitants. Zorawar Singh was designated as Titualar Raja of Bhadarwah in 1833 A.D. and was termed as Chhota Raja. In 1844 A.D. Sri Singh was seated on the Gaddi of Chamba. Due to family dispute, Zorawar Singh fled to Bhadarwah and then to Jammu where he tried to gain the support of Jammu and rebel elements of Bhadarwah, but he could not succeed till his death. Zorawar Singh's son, Prakaram Singh was made Raja of Bhadarwah in 1845 A.D. But owing to Anglo-Sikh war of 1845, Sikh dominion of the Hill States became very weak and Gulab Singh availed this opportunity to annex Bhadarwah with his territory. The same year when Prakaram Singh was its Raja, Bhadarwah passed on to Maharaja Gulab Singh in 1846 A.D.
During Gulab Singh's time, Bhadarwah remained a military administered area, administered by a Special Administrative Officer and it was only in the later year of Ranbir Singh's rule, that Bhadarwah was bestowed as Jagir to Amar Singh. Bhadarwah in Ranbir Singh's time remained as private Jagir. Ranbir Singh appointed Lhab Joo as Kardar (Tehsildar) of Bhadarwah in 1859 A.D. Bhadarwah remained a Jagir of Raja Sir Amar Singh during 1978-81 A.D.
On November 10,1886, as per report of Tehsildar Bhadarwah, the Jagir of Bhadarwah was handed over to the representatives of Raja Amar Singh by Tehsildar Bhadarwah and it remained his personal domain with all Powers for its administration, development and revenue collection till his death in 1911 A.D. Thus for almost all practical purposes Amar Singh was ruler of Bhadarwah between 1886 and 1911. When Amar Singh passed away in 1911. A.D. Maharaja Pratap Singh issued an order regarding the Jagir and a committee of management was constituted for the estate of Hari Singh for the disposal of civil and criminal matters. Pratap Singh passed away in 1925. He had no issue and therefore Amar Singh's son Hari Singh occupied the throne of J&K State. The status of the Jagir was changed. Its name as private Jagir was changed to Private Domain and incharge jagir was changed to Director Private Domains. On the recommendations of Private Domain Assimilation Committee, the status of Bhadarwah ended in 1930 A.D. Consequently Bhadarwah became a tehsil of Udhampur District in 1931. After establishment of District Headquarter Doda, Bhadarwah was made a tehsil of this District. Consequent upon reorganization of District and Tehsils, Naibat Thathri and Niabat Bhalessa of Bhadarwah Tehsil also became fully fledged Tehsils in 1981. The waters of the Chenab start from snow melt from the Bara-Lacha Pass, in Himachal Pradesh. The waters flowing south from the pass are known as the Chandra River and those that flow north are called the Bhaga River. Eventually the Bhaga flows around to the south joining the Chandra at the village of Tandi. A motorable road runs along the Bhaga River, from Khokhsar to Tandi. The Chandra and Bhaga meet to form the Chandrbhaga River at Tandi. It becomes the Chenab when it joins the Marau River at Bhandera Kot, 12 km from Kishtwar Town. It flows from the Jammu region of Jammu and Kashmir into the plains of the Punjab, forming the boundary between the Rechna and Jech interfluves (Doabs in Persian). It is joined by the Jhelum River at Trimmu and then by the Ravi River at Ahnedpur Sial. It then merges with the Sutlej River near Uch Sharif, Pakistan to form the Panjnad or the 'Five Rivers', the fifth being the Beas River which joins the Sutlej near Ferozepur, India. The Chenab then joins the Indus at Mithankot. 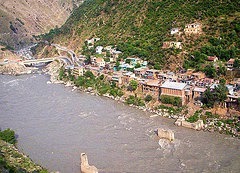 The total length of the Chenab is approximately 960 kilometres. The Chenab River is also called as the “RIVER OF LOVERS” because of the . It is the iconic river around which Punjabi consciousness revolves, and plays a prominent part in the tale of Heera Ranjha , the Punjabi national epic and the legend of Sohni Mahiwal. Salal Hyderal Project is already functional. This river has been in the news of late due to the steps taken by the Indian government to build a number of hydroelectric power dams along its length in India, notably Baglihar Dam , as part of the Indus Basin Project . These planned projects on Chenab have been contested by Pakistan, though Pakistan's objections have been dismissed by the Indian government. The Doda River or the Stod River is a river 79 kilometres (49 mi) long, which forms the Stod Valley in the Zanskar valley of the Ladakh region. The Doda River contributes to the minimal agricultural production of the Zanskar valley by providing irrigation to the fields of barley, wheat, buckwheat and peas. Accessible in the summer, the Pensi-La mountain pass at the source of the river receives heavy snowfall along with the other pass Zojila , which cuts off the Stod Valley from the rest of the country during winter, and the river freezes during this season. The river source at Pensi La lies 350 kilometres (220 mi) east from the Srinagar r, the capital of Jammu and Kashmir. The Doda River is famous for adventure sports. Rafting events are organised throughout the length of the Doda and the Zanskar. We reached late at night to New town of Doda and after checking in the government guest house, we went out to the sleepy town to have dinner. After dinner we just got knocked out and exhaustedly slept off. This New town of Doda is built on a plateau that is on top of a mountain. The new town is well planned city with proper drainage, proper lanes, proper market and modern cemented houses. Because the old town of Doda which was on a very lower level, got completely submerged in the back waters of Chenab River after Baglliar Hydral Project dam was constructed. Wonderful narrative and photos. 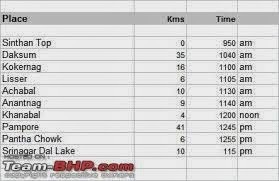 Great travel log. a very beautiful collection of historical perspective, besides a record to be preserved for future generations. A journey in the beautiful trek.The breathtaking pictures backed by the history It is a masterpiece. Thank you all Anonymous ones who enjoyed reading my blog. Thank you Vineeta for enjoying reading my blog.